The leak free connection between nozzle and tank ensures zero spillage, and simultaneously prevents any contaminants entering the fuel tank – delivering improved performance outcomes and reduced downtime for each machine. Cleaner fuel also means improved filter and injector life, delivering further savings in machine related expenses and increased availability for operational hours for each machine. The on-going development of the FAST FILL SYSTEMS product range, addresses problems associated with servicing your diesel powered units. FAST FILL SYSTEMS are compatible with Banlaw & Wiggins systems. This system operates at a fill rate from 125Lpm to 800Lpm (dependent on delivery pump). 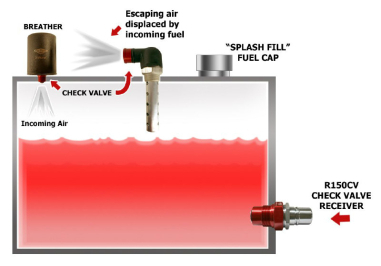 Once the level of the diesel reaches the vent (within ~60L from the top of the tank), the check valve for the escaping air is shut, the incoming fuel pressurizes the tank until 11PSI, at which then shuts off the filling nozzle. This system requires the the tank be completely sealed in order to operate AND capable of handling the 11PSI fill pressure. This system operates at a fill rate from 125Lpm to 800Lpm (dependent on delivery pump). 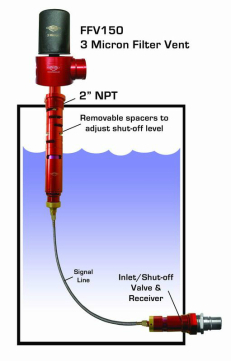 Once the level of the diesel reaches the vent (within ~60L from the top of the tank) the float system within the vent is shut, pressurizes the signal line back to the receiver, which then shuts off the filling nozzle. This system DOES NOT require the the tank be completely sealed in order to operate and therefore any tank type can be used.